So often when you travel, you look around and see places and things that remind you of home. In Japan it was the same species of pigeons that commonly hang around public buildings in America. In Ecuador it was a river walk that took me to San Antonio. But that never seemed to be the case in East Africa. From the chaotic streets of Nairobi to the tall termite mounds in the Serengeti, the landscape always seemed to hold strange, new and wonderful sights – and never anything that spoke of my native country. It was a different world entirely, or so it seemed. 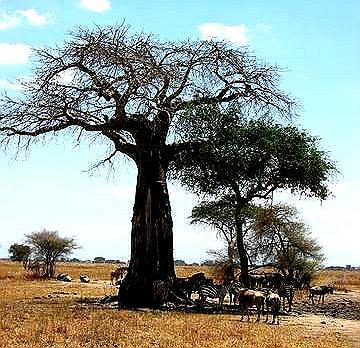 Among the more exotic African sights for Kim and I were the abundant baobab trees in Tarangire National Park. Some call these the upside down trees because they look, especially during their long leafless period, like their roots are sticking up in the air. One African myth is that God was so displeased with the taste of its fruit that he turned the tree upside down. Another legend has it that the baobab complained that it wanted to be taller, like the palm tree, and wanted flowers like the Flame tree, and then that it wanted tastier fruit like the fig tree. The constant whining soon upset the gods, and so they replanted it upside down to shut it up. I don’t blame them. I don’t much like to listen to whiners myself. In actuality, the baobab tree, which can grow to over 80 feet tall and live for thousands of years, grows and looks like it does to fit its often arid environment. 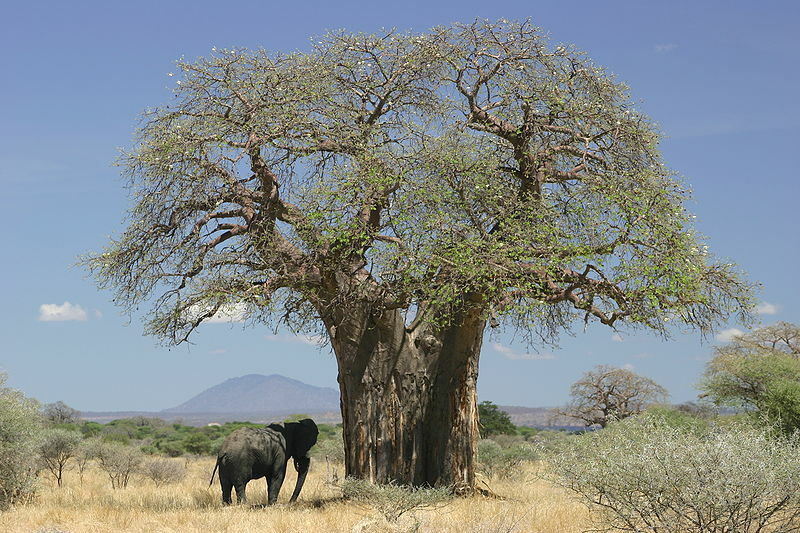 It sheds its leaves quickly after they sprout to conserve water, and its huge trunk is its own water storage reservoir to help it survive the dry times. These trees, at least to me, had a strange beauty about them, especially as we saw many different kinds of wildlife gathered beneath them for the shade they provided. And later I learned that both wildlife and humans sometimes make their homes in the tree’s hollow trunks. This tree always reminds me of my favorite book “The Little Prince”. When you see a picture of a real one (or the actual tree), it is easy to see what his inspiration was for that part of the book. I’ve had two recent encounters with this legendary tree lately and now this is the third. When such serendipities occur, I try to pay attention! Excellent writing and interesting collection of ideas. Thank you.